It lets you safely develop more power with nearly no running costs! 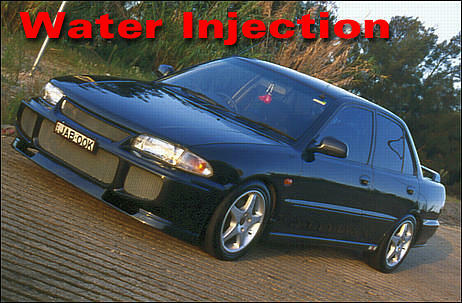 Water injection is a technology that is nearly as old as the car itself. However, like many automotive technologies, it has waxed and waned as fashion has dictated. Water injection has the ability to suppress detonation, allowing the use of higher cylinder pressures. It is easy to control and relatively simple to install. In times of tight emission controls and rising petrol costs, water injection is one of the best ways of controlling detonation. And it has another major advantage over taking other approaches - the 'fuel' is available at almost zero cost! This has major implications for both emissions and fuel economy at high engine loads. In fact Saab has used water injection on some of their turbocharged cars, working at high loads in conjunction with leaner air/fuel ratios to reduce emissions output and improve fuel consumption. To put this another way, at high engine loads it is possible to reduce the amount of fuel being used, replacing it with water without sustaining any loss of power! UK company ERL at www.aquamist.co.uk produces some very sophisticated water injection systems - probably the world's best. The company has developed their own pumps which work at high pressures and low flows. The pumps use an approach a little like a bicycle pump. Water is drawn in during the induction stroke of the solenoid-like pump, then pushed out past a valve by internal spring pressure. The stainless steel armature pulses in this way 50 times a second, delivering up to 160cc a minute at over 70 psi. 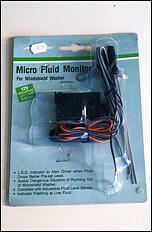 The pump has built-in electronics to control this pulsing, with a 0-12 volt input control signal able to vary the flow. While URL use a sophisticated ECU to control some versions of the system, the availability of the control signal input means that the output of the airflow meter or MAP sensor could probably be adapted for the same purpose. 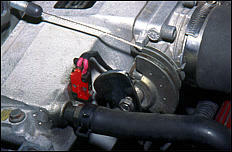 Aquamist suggest a nozzle position just prior to the throttle body for road cars, while the supercharged aircraft of many years ago used up to 18 nozzles positioned around the supercharger exit diffuser. 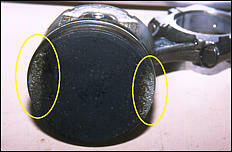 Testing of the two systems discussed below indicated that the best nozzle location should be found through experimentation. 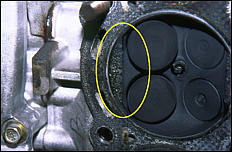 The amount of water that needs to be added to an engine is also best assessed through trial and error. If the flow of water is initially high and then is slowly reduced, this approach can be done quite safely. However, testing on aircraft engines indicates that the mass of water required to suppress detonation is 20-30 per cent of the weight of the total liquid charge (that is, the water plus the petrol) being consumed. The system should be configured so that water is only ever injected when there are high intake airflows. A good quality boost-pressure controlled water injection system can be built using off-the-shelf components. The system gives an extremely fine spray and can be used with water/methanol as well as pure water. While the injection of water is not proportional to load (it is proportional to boost pressure), there is a variation in the supply of water which is still better than many systems provide. The best part of the system is that it is maintenance-free, other than requiring the refilling of the water tank as required and the occasional cleaning of the filter. 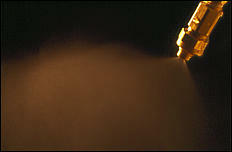 The nozzle used is an air atomising design produced by US company Spraying Systems. It has two connections - one for compressed air and the other for water. The compressed air is directed out of two orifices so that it collides with the water stream, scattering it into the tiny droplets. The pressure to supply both the water and the compressed air comes from the turbo or supercharger. The part number for the nozzle is SUE18A and it is available from agricultural irrigation and spray suppliers. Unlike many air atomising nozzles, the SUE18A works effectively at pressures below 50kPa (7psi). Around 200 ml/min flows through the nozzle when it is supplied with water and air at around 20 psi (1.4 Bar) boost. If this flow is too great, a ball valve can be placed in the water supply hose to allow easy adjustment of the flow. If the ball valve is closed down to restrict the water supplied, the remaining water will then be even better atomised! If more than 200 ml/minute of water is required I suggest that you use two or more nozzles. The water supply for the nozzle should be through a small water filter to avoid filter blockages occurring. 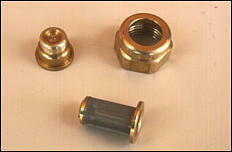 An appropriate filter is available from the suppliers of the nozzle or a small garden irrigation filter can be used. The nozzle must be mounted so that it flows into the intake system before the compressor and the water should be injected after the airflow meter (if present) to prevent the water droplets upsetting the air metering. The fluid storage container must be pressurised if the water is to be forced through the nozzle. A custom tank can be made or a large pressurised radiator header tank pressed into service. Preferably the tank should be at least 5 litres in volume for each nozzle used. Note that the tank must be capable of handling the constant cycling of internal pressures up to the peak boost level. A low fluid warning buzzer should be fitted. 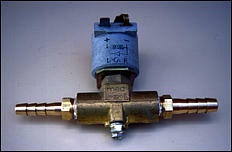 Plumb the system using a ball valve to adjust the supply of water and a boost-pressure triggered solenoid (pictured) to give a positive starting and stopping behaviour. An alternative to the use of the solenoid is to install a vacuum-operated valve (such as the EGR valve) to vent the tank back to the inlet system, causing the tank pressure to more closely follow boost when the throttle is lifted. However, the solenoid valve is the safer of the two approaches: if the water ever flows into the intake when the engine is stopped, very major engine damage can be caused when it is attempted to be re-started! If you require that the water be injected after the turbo or supercharger, or a large pressurised tank is unwieldy, a pumped system is a better option. 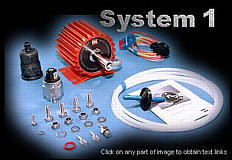 This type of system is also suitable for a naturally aspirated car. The pumped water injection system again uses Spraying Systems nozzles. The SF2 and SF3 Fogging Nozzles are designed for humidifying the air in chook sheds, amongst other agricultural applications! The nozzles require only pressurised water to produce a fine spray, although note that the droplets are not as fine as those produced by the air atomising nozzle described above. The nozzles can be equipped with in-built filters and check valves that prevent them dripping. The electric pumps used in for agricultural crop spraying or in good quality windscreen washer systems can be used. 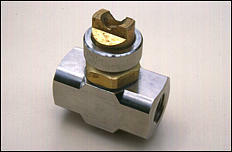 If the spray nozzle is located after the throttle butterfly, a solenoid valve should be inserted in the water supply line so that there is no possibility of water being sucked through the pump during periods of high manifold vacuum. The easiest activation technique for the pump is to use a manifold pressure switch that simply turns on the water injection when the engine is on boost, though of course this then does not give proportional control. 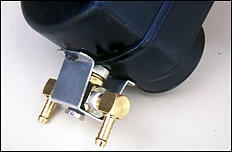 Another approach that will give slightly earlier switch-on is to use a throttle microswitch (pictured). Another entirely different way of varying the water injection rate is to drive the pump with a trailer electric brake controller. These devices are available from caravan and similar suppliers and are designed to energise the electro-magnets that are located in the brake assemblies of some caravans and trailers. One class of controllers does this by measuring the braking force that the car is undergoing and increasing its output voltage proportionally. I envisage the controller reversed in orientation so that it measures acceleration. If it was then connected to the water injection pump, the harder the car accelerated, the higher would be the pump speed and so the greater would be the addition of water into the intake air! So which is better if you are running a forced aspirated car - water injection or intercooling? Each has its own advantages and disadvantages. Intercooling is a reliable means of reducing intake air temperatures and depending on the approach chosen, it can be a very simple system. However, it should be noted that while air/air intercoolers have few component parts, water/air intercooling is more complex than water injection. Intercooling systems require little or no maintenance, and a good intercooling system will provide an engine power increase in addition to preventing detonation. However, intercoolers are much larger than water injection systems and are generally harder to package. Finally, all intercoolers cause a restriction to intake flow. Water injection is very effective at preventing detonation. It is not subject to efficiency drop-offs through heat soak and causes no restriction to intake flow. It is easy to fit as an add-on to an existing system, and because its components can be spread around the car, it is generally very easy to package. Unlike intercooling, water injection will not necessarily give a power increase. However, the biggest disadvantage is the requirement to carry a relatively large water tank - and to keep on filling it!